Would you be surprised if someone told you that enhancing intelligence could be as simple as breathing? With all of the recent research in this area, it has been suggested that with each breath, you could be providing benefits for your brain skills. Perhaps even more interesting is that companies today are catching onto the benefits of each breath, which has led some to offer sessions for their staff. If we continue to see benefits, we could be helping an entire generation improve their brain skills. But just how is it that your breathing can improve brain skills? The answer relates to a practice you have likely heard about – meditation. We have known for some time that meditation helps people to lower stress. Today, however, we now have more sophisticated ways of scanning the brain to see exactly what happens when someone meditates. We can actually look at how meditation influences the brain's structure and functioning. More recent looks show that meditation could help to increase mental 'sharpness' along with better recollection of information. With a lot of previous research focusing on Buddhist monks, a newer study looked at people who only meditated for forty minutes a day. The results showed that these people had thicker parts of the brain that are linked to memory and decision-making. They also tended to have a better attention span as well. But the meditation in question is not just any kind of meditation – it is one that relates to breathing. This particular kind of meditation involves the subject putting their focus on their breathing. As basic as it sounds, this straightforward practice helps subjects to focus their attention, which then helps them to get sharper focusing skills and clarity. The very act of focusing on breathing has immediate calming effects. However, long-term it is thought that this kind of regular meditation can improve your brain skills. As mentioned, there are benefits to 'ordinary' people who do this for just over half an hour each day. This means that while we may see more significant benefits in those who dedicate their lives to this practice, most people can still enjoy benefits without the enormous time commitment. Whether you have an hour each day or even just five minutes here and there, focusing on your breathing in meditative practice could help keep you calm, relaxed and sharper at work or at play. 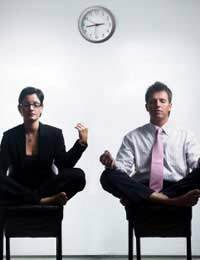 Interestingly enough, some companies today are now realising that by offering classes for their employees to learn meditation, they can improve workplace focus and decision-making. Employees may also have better retention of information. Overall, the move is thought to help improve productivity in the workplace. At the very least, it may help reduce employee stress as well, which can mean less missed workdays due to ill health.